A physically perfect, but innocent, man goes in search of his twin brother, who is a short small-time crook. It's a perfectly fine '80's comedy, but it's not anything better than that. There are charming moments, and DeVito & Arnold shine- as do Preston & Webb, although I wished they had more to do- but they're watered down by a plot with too many moving parts and a messy execution. It's a bit long, tries a bit too hard to stretch its premise, and doesn't deliver enough of a punch to be anything special. Worth watching if you're a fan of the leads, but nothing memorable. Surprisingly more enjoyable than I was expecting it to be. Stupid premise, yes, but Arnie gets to flex his comedy muscles and DeVito does his manic DeVito thing and the end result is just funny and heart-warming enough that I never felt like I wanted to turn off the TV or watch something else. I'll be damned if I'm going to score it any higher than this though. Doesn't really do anything clever, but it's a mindless, hyggelig time. Wow, what the hell, just spotted Terry Bozzio's name in the credits. Anyways, I hilariously shed a tear at this dumb movie, so one thumb up. 37th film of 2018. With the right material, Schwarzengger and DeVito could have been a dynamite duo, but once the gimmick of them being brothers wears off, Twins is a real slog that is only watchable due to misplaced feelings of nostalgia. Arnie's naive bumpkin schtick quickly gets old, and DeVito isn't nearly as charismatic here as it he is in many other comedies from the period. The dopey crime subplot is lame and was probably shoehorned in, while the sentimentality is grating. It's also short on laughs. 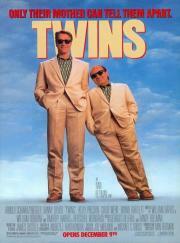 There isn't much to say about "Twins", at least not in any meaningful sense. A film based primarily around the absurdity of its two physically and morally opposed leading men being twins, the bulk of the actual narrative takes a backseat, occasionally rearing its head to introduce conflict into a story that would otherwise have very little. And yet, even in its slightness, "Twins" is a well-meaning, lightly humorous comedy that has no pretensions about being anything close to high art.